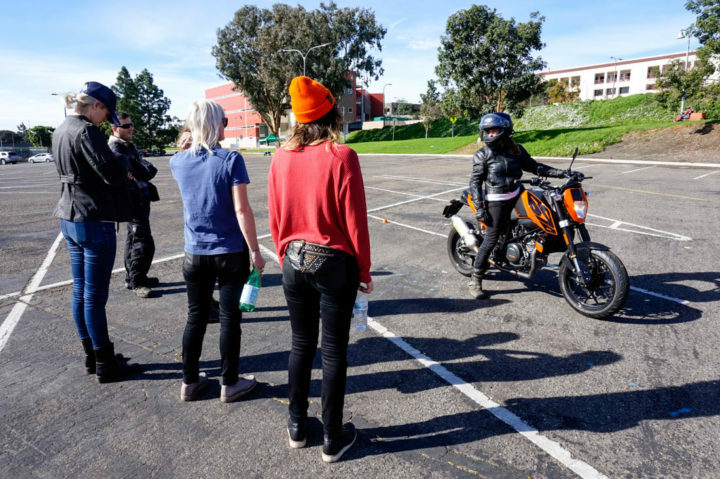 This past Sunday morning, at an unusually early hour, I rolled into Saddleback College in Mission Viejo, California to attend a Total Control Intermediate Rider Clinic hosted by Moto F.A.M. and Saddleback Rider Training. For those unfamiliar with Moto F.A.M., it’s a truly amazing organization dedicated to raising funds for riders who have been in serious motorcycle accidents (full disclosure: I’m a former Moto F.A.M. board member and a huge fan of their cause). They’re also big on safety and awareness, and this weekend marked the first in a new series of classes Moto F.A.M. will offer in order to help improve rider skills. I took the MSF Basic RiderCourse almost 7 years ago, but since then I haven’t really done anything specific to improve my riding skills other than putting down a whole bunch of miles. 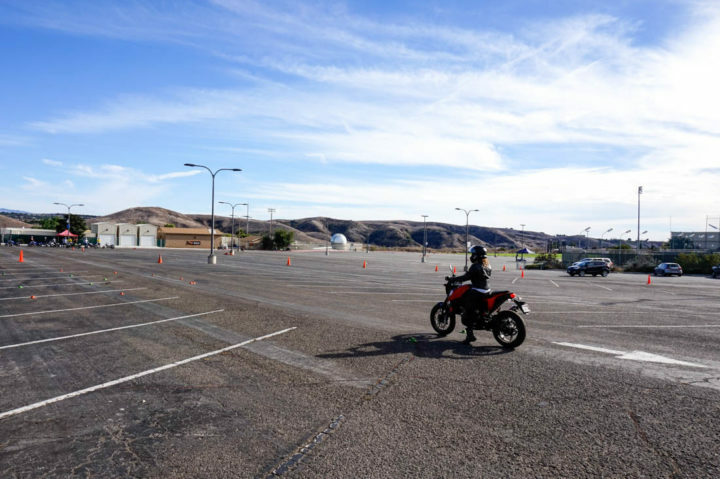 The Moto F.A.M./Saddleback course is aimed at intermediate riders, meaning you have to already have a motorcycle license and at least 500 miles under your belt to participate. For this class, I was part of a group of six experienced riders all eager to improve on existing skills and learn something new. 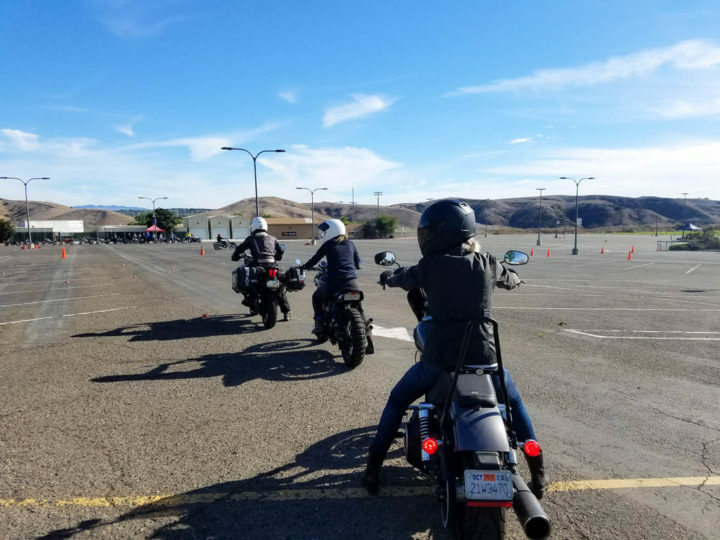 Both the classroom and riding portions of the course focused heavily on traction, brake control, vision, line selection, and steering. For each exercise, our instructor Andrea would jump on her bike and show us a wrong way and a correct way to do them. The waiting in line part was a bit rough since we got hit with an unexpected January heatwave, and the course requires you to be in full gear the entire time. That’s obviously a good requirement that makes sense, but it still doesn’t make it comfortable to sit still on a running bike wearing leathers in 85 degree weather. For this time of the year in California, I would recommend bringing a warmer jacket for the early morning hours and then a lighter one you can change into as it starts to heat up. The course is 8 hours long (though ours ran even longer than that due to some unexpected bike hiccups), and you want to be able to stay focused for as long as possible without overheating or being too cold. The exercises ranged from tight, low-speed turns to rapid stops and swerving. For the one in the clip above, we were supposed to ride around a circle of cones while keeping eye contact with our instructor. It combines elements of throttle control, line selection, and riding vision into one exercise. This was probably one of my favorites of the day. I’m used to looking where I’m going, but not keeping my eyes off the road completely, so it was an interesting experiment. No matter how good of a rider you think you are, there’s always more to learn, I promise. Taking an intermediate or advanced riding class is a good way to at the very least get a useful refresher on safety. My biggest takeaways from this class were improved body positioning in corners, plus some useful knowledge about tires. Did you know that there is a DOT code stamped on motorcycle tires that tells you how old the tire is? I sure didn’t. Follow @moto_fam on Instagram for info on upcoming classes and to stay updated on all the other great things this organization does for our fellow riders. Sanna likes motorcycles, kittens, and punk rock. When she's not at her day job as the managing editor of Roadtrippers, she's probably riding twisties in the mountains or camping in the desert with her moto squad. She has a 2015 Dyna and a Shovelhead chopper, but she secretly dreams of owning a 70s muscle car.